Domains International invites all professional domainers to participate in the philanthropic auction of the domain "GoldenFoundation.com." The auction begins at 11:00 AM EST and ends at 04:00 PM EST the same day. The first bid is $100 and the minimum bid is $75.00, and the BIN of $25,000. Part of the results of the auction (whatever the amount reached), ie 75% will be delivered to the organization "Save the Children", which was already informed about this initiative. 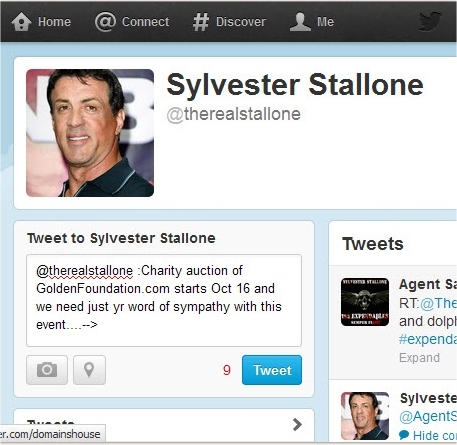 However we´re invited you to participate in the auction or to convey your sympathy and solidarity for the event, some of them associated with some celebrities to philanthropy, such as Julianne Moore, Kirsten Dunst, Jennifer Garner, Mia Farrow, Brad Pitt, Jennifer Aniston, Sylvester Stallone and others.